After some success in making homemade, low-sodium versions of ketchup and relish, I had expected mustard-making to be a breeze. No so, by a long shot. I had been hoping to develop a low-sodium, whole grain mustard. After an expensive trip to Whole Foods for brown and yellow organic no-salt mustard seeds and champagne vinegar, I thought I was good to go. My first effort flopped when I was unable to successfully process the mustard seeds in my antique food processor. I was left with a watery mess! Armed with a fresh supply of seeds, this time managing not to spill them all over the kitchen floor, I tried again. This time, I turned to the March issue of Sunset, which includes a feature on homemade mustards. Soon I had a mustard mixture, including cognac, soaking on the kitchen counter for three days. Sounded promising but turned out to be yet another murky failure. Third time being the charm, here is my low-sodium version of Sunset’s “Ballpark Beer Mustard”. I decreased the dry mustard, skipped the salt and switched to brown sugar, also increasing the amount. TIP: you will need to let part of the mixture sit overnight. The original instructions read “10 minutes” for prep. It turned out to have too much kick for my husband, though. He also reminded me that he never uses mustard on anything…I think this is a work in progress. 1. 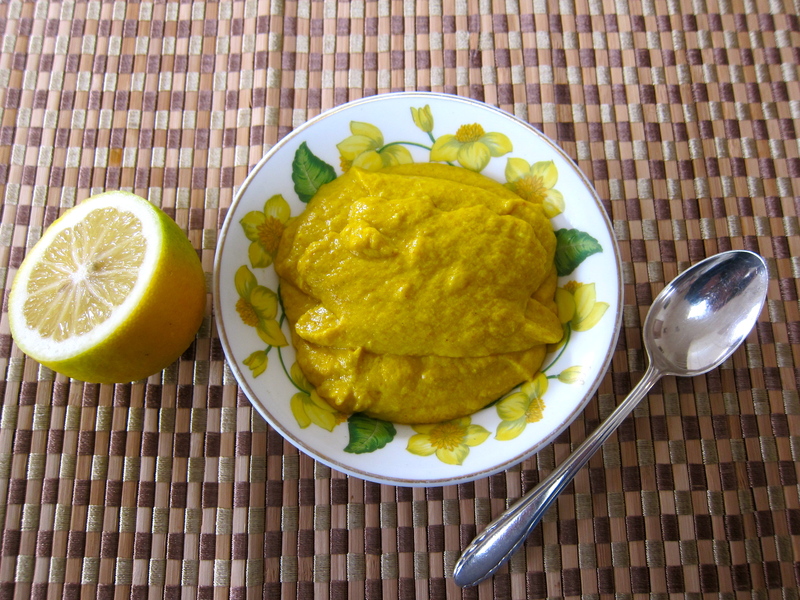 Using a metal bowl, whisk together dry mustard, beer, 2 tablespoons water and turmeric until smooth. Chill, covered, overnight in fridge. 2. Using a medium-sized saucepan filled with an inch or two of water, bring to a simmer. 3. To the mustard mixture, add the egg, cornstarch, lemon juice and sugar. Whisk to blend. 4. Set bowl over simmering pan of water and cook, stirring, until mixture thickens, about five minutes. 5. Store, covered and chilled, up to two weeks. I hope you drank the rest of the beer, sounds like you deserved it! Superb effort on your part. That article caught my eye – thanks for doing all the testing work. I love love mustard and will be sure to try this. Thanks, Lynda, I’m still on the lookout for a whole grain style that works! Great tenacity, Liz! I love mustard and will definitely be trying this soon. I’ve got the Sunset mag you mention but wanted to see first how your venture into mustards would go. I’m thinking you definitely deserve the rest of the beer. The whole six-pack for that matter. Even at 9am! I have tried the Sunset cognac one twice and written to them about its spectacular failure(s) in my kitchen, wanting to know how they got that creamy texture. Jury is still out. Thanks for doing all the research for me. A sodium free mustard will be great to cook with as well. From potato salad to chicken dishes. Thanks, thanks, thanks. How interesting! I’ve made lots of homemade condiments, but never mustard. I would have assumed it would be easy, like you did. I’ll be curious to see if you perfect yours!! I will be working on it – just met a chef shopping at our Farmers Market and he said he’d email me his recipe – fingers crossed. I’m a big mustard-lover myself. Thanks for your comment! Gosh, Liz, I’m with you. I would have thought mustard making would have been easy , too, but then I’ve never tried. Thanks God, I;m content with the version I can get from Trader Joe’s. Thanks, but check out the salt – I love their aioli mustard – same problem. Are you coming to Santa Monica event in November?? Elizabeth, I used to make mustard after a friend gave me recipes and seeds. The instructions are great and there are several good recipes. I will copy and send with Tom in case you want to do this again some time. I had great success, but Tom is very allergic to mustard, so I was the only appreciator. Wonderful and great thanks – are you going to the Mission Hills gathering end of the month? Shouldn’t we bring food? Hey, thanks – but I can’t wait to try your recipe, Averie.